About 1,000 people gathered outside the Berlin Traffic Club building on Alexander Platz, Bild reports. Riot police formed a human chain to prevent protesters from getting too close to the AfD party headquarters, where members were holding a celebration party. Bottles and stones were thrown from the crowd and some arrests were made for “minor incidents” Spiegel reports. — Martin Jäschke (@jaeschko) 24 сентября 2017 г. 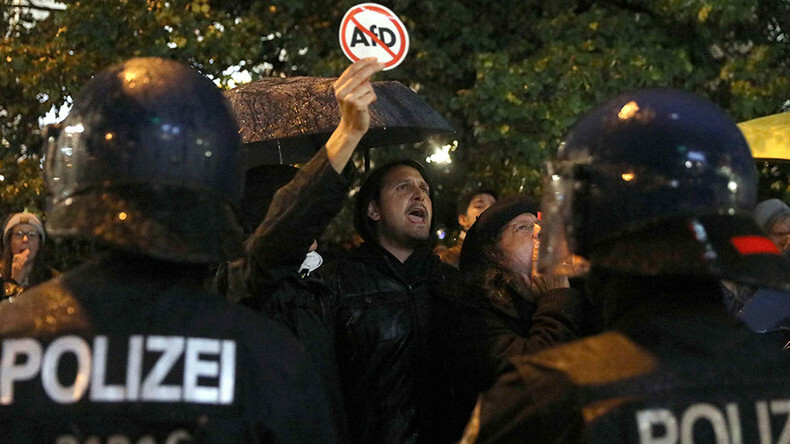 There were spontaneous protests against the entry of the AfD in the Bundestag in other German cities. In Cologne, about 400 people marched through the city center. Anti-AfD protests also took place in Hamburg, Frankfurt, Munich and Düsseldorf. The right-wing party’s rise is said to be as a result of its anti-immigration sentiment and discontent at German Chancellor Angela Merkel’s open door policy toward refugees. Merkel secured a fourth term as chancellor in the election, but said AfD’s result would require “thorough analysis” to better understand the concerns of those who voted for them. The right-wing, anti-immigrant AfD party came in third with about 13 percent of the vote in the German election on Sunday, according to exit polls. This grants them access to the federal parliament, the Bundestag, for the first time. Public support for AfD has grown amid mounting anti-refugee sentiment, following Angela Merkel’s open-door policy. Since 2015, when Merkel announced the decision to allow in hundreds of thousands of refugees, around one million asylum-seekers have arrived in Germany, putting a strain on its social welfare system and sparking the rise in anti-migrant sentiment, as well as opening deep rifts within German society.